← Should we be concerned about the shrinking church in western Christianity? Neither the 1 Kings nor the Genesis text implies immediacy of action on that very same day; instead they point to the certainty of the predicted consequence that would be set in motion by the act initiated on that day. Alternate wordings include at the time when, at that time, now when and the day [when] (see Gen. 5:1; Ex. 6:28; 10:28; 32:34). (Hard Sayings of the Bible, p. 92 [emphasis in original], as cited by Peter Grice). Referring back to this incident, the apostle Paul writes: “sin came into the world through one man, and death came through sin, and so death spread to all because all have sinned” (Rom 5:12). And Paul goes on to say that “the judgment following one trespass brought condemnation” (Rom 5:16). Continuing with this theme, Paul asserts that “the wages of sin is death” (Rom 6:23). So, in both the New Testament and the Older one, we are clearly taught that death is the penalty God brings upon all who sin, which is, by definition, to disobey God’s command, in whatever form that command comes to people. Breaking God’s commands is a violation of their own moral conscience. It is that conscience which will be God’s standard in judging everyone, in the last day, so that no one who is condemned will have any doubts about God’s justice. Whether taught by the particular revelation of God, or simply by way of conclusion from common human experience, all humans expect to die, whether or not they are aware that their death is not a natural necessity but is the experience of God’s judgment upon sin. As we read further in the Bible, death is a common subject. Even those who have lived in faithful obedience to God die, just as the blatantly rebellious do. But death is also frequently described as an immediate act of divine judgment upon people for their wickedness. Genesis 38:9, for instance, tells us that “Er, Judah’s firstborn, was wicked in the sight of the Lord, and the Lord put him to death,” and then we read that “what [Onan] did was displeasing in the sight of the Lord, and he put him to death also” (38:10). Much later, during the period shortly after God had sent his Spirit upon the church at Pentecost, we read that Ananias and Sapphira had lied about their use of funds from the sale of their property and Peter had rebuked Ananias because he did not “lie to us but to God.” Upon hearing this, Ananias “fell down and died” (Acts 5:5). When his wife Sapphira was confronted about their deceit and about God’s judgment on her husband, she too fell down and died (5:10). The result of this act of judgment by God was “great fear,” which “seized the whole church and all who heard of these things” (5:11). Clearly, then, death as a universal human experience is the consequence of sin and, on occasion, the end of a person’s life suddenly or “prematurely” is clearly understood by the community of God’s people to be an act of divine judgment. God’s people take comfort from this in a text which informs us that the Lord will “find out all [his] enemies,” those who hate him (Ps 21:8), that he will “swallow them up in his wrath, and fire will consume them” (Ps 21:9). The righteous even pray that God will put the wicked to shame and “let them go dumbfounded to Sheol” (the place of the dead) (Ps 31:17). All the inequities of this life, where the righteous often suffer from other people’s evil, and where the wicked prosper from their evil doing, will be addressed in the day of God’s final judgment. The first death is not the end of personal life, only of our bodily experience of life (cf. Mt 10:28). This state continues until everyone is bodily raised from the dead, so that period of time is commonly called the “intermediate state,” since it is the time between a person’s bodily death and resurrection. Both the righteous and the wicked continue to exist in a conscious personal way after death, but the experience of people in these two groups is significantly different. Both are unembodied but personally, consciously alive, and their experience in the intervening period is an anticipation of the different destinies that await them after resurrection and judgment. Sheol in the Old Testament and Hades in the New Testament were both references to the place of the dead, and so they were the common expectation for both the righteous and the wicked. 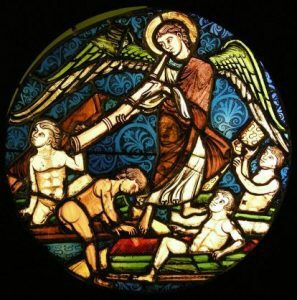 But there are indications that this state was unpleasurable for the wicked (having more the nature of hell), whereas it might be pleasurable for the righteous (hence, more like heaven). Not surprisingly, given the cumulative nature of divine revelation, the New Testament is more descriptive than the Old in regard to the condition of the dead. Luke 16:19-31, the account of the rich man and Lazarus who have both died, is a particularly significant text in regard to the condition of the dead. Interpreters disagree whether Jesus was telling another parable or whether he was referring to an historical incident, involving real people. In either case, however, it clearly depicts the intermediate state since the final resurrection has not taken place yet. The rich man’s brothers are still alive on earth and the rich man is in Hades, not Gehenna. It might be unwise to assume that this is a portrayal of the condition of the blessed dead in general, and John Cooper, who has written a masterful book on Body, Soul, and Life Everlasting, seems reluctant to lean on the text very heavily as support of dualism (126). I think it may be more useful than he is willing to hope, however. Even if Jesus was using a popular image in order to make his ethical point, rather than intending to teach us something about the afterlife, the ethical point gains its force from the reality that decisions made in this life are final and that they have consequences for us immediately upon our deaths. The parable confirms what we learn elsewhere about the critical importance of this life, because it is for our attitudes and actions here that we will give account on the judgment day. Accordingly, we find Lazarus in a good place – “with Abraham” (Lk 16:22) beyond the world in which enemies of God both angelic and human have any power to affect his life. By contrast, the rich man is “being tormented” (Lk 16:23) in Hades, and there is a “great chasm” between the two men, with no further opportunity for either of them to act in a way which would send them in the opposite direction. “Post-mortem evangelism accessibilism” (see my “Typology of Positions Concerning the Salvation of the Unevangelized”) is clearly not an option, according to this narrative. The rich man is aware of the irrevocability of his own situation, and he can only hope now that his five brothers will act more wisely so that they do not end up where he is after death, a situation which anticipates where he will eventually be (Lk 16:27-31). The judgment that Lazarus and the rich man will hear from God when they stand before his judgment seat will be no surprise, because their destiny, as the consequence of their acts while alive, is already very clear. Jesus informed the thief beside him on a cross that he would be with Jesus, in Paradise, that day (Lk 23:42-43). In intertestamental literature, “paradise” denotes “the Edenic abode of the Lord’s saints, both the final kingdom and the intermediate resting place of the dead. It is often located in heaven. It can also be in Hades” (Cooper, 128). The New Testament speaks similarly in Revelation 2:7 and 2 Corinthians 12:2-4, and I think that Cooper is right that we have here “a virtually unambiguous case in which Jewish eschatology, with its anthropological implications, is appropriated as part of the Christian kerygma” (129). 2 Corinthians 5:1-10 is appealed to by both proponents of the intermediate state and of immediate resurrection, but it rules out the extinction-re-creation proposal (cf., Cooper: “nonexistence between embodiments is out of the question” ). Those who give it an immediate resurrection reading do so, not because of the force of that meaning in the text itself, which most naturally indicates a period of disembodiment, but because of a prior commitment to monism (cf. Cooper’s discussion, 144-49) and, in any event, immediate resurrection implies dualism just as much as the intermediate state because it depicts one person who inhabits two different bodies (cf., Cooper, 165-69). By contrast, monism has the critical problem that there is not an identity between the one who dies or ceases to exist and the one who is recreated. “If persons are essentially tied to particular bodies, and if we have two bodies–one earthly and one resurrection body, then it logically follows that we have two persons, not one and the same person” (Cooper, 169). It is not enough to argue “exact similarity” between the two embodied persons because “numerical identity and exact similarity are different properties” (Cooper, 174). Philippians 1:21-24 parallels 2 Corinthians 5:6-10, as a comparison between being in the body and being with Christ which, again, indicates the possibility of personal existence while disembodied. Hebrews 12:23 speaks of believers as having joined “the pneumatais (spirits) of righteous people made perfect.” These are clearly human spirits, and they are most plausibly existent human beings in the intermediate state. There is a plural number of individuals, whereas a reference to breath or life-principles would not be individuated (Cooper, 113). Furthermore, they have been “made righteous” which would not be said of mere life-principles. The text does not specify whether this is their intermediate or final state, but in either case we would have dualism. Either they are perpetually disembodied or they are in an intermediate state, and it is most probable that they are awaiting the “better resurrection” of Hebrews 11:35 (Cooper, 113). John saw the souls of the martyrs under the altar (Rev 6:9), and it is clear from Revelation 20:5-6 that they are awaiting resurrection. Given the nature of apocalyptic literature, this is not a text which can bear much weight in the monism-dualism debate, but psych? is clearly being used to refer to humans in the intermediate state, and that is significant (Cooper, 117). I consider the experience of Jesus between his death and his resurrection to be of particular importance. Clearly, Jesus’ own resurrection was not immediate; it happened on the third day after his death, and Jesus told the thief on the cross something very important. He introduced his statement with the phrase “I tell you the truth.” (This phrase is unique to Jesus in the New Testament, who used it 76 times, to affirm that he was about to say something worthy of particular attention.) Jesus then promised that the thief would be in paradise that day with Jesus, that is, in the abode of the righteous dead. Peter, on the other hand, simply indicates that Jesus went to Hades (Acts 2:27, 31; cf. Psa 16:10), the realm of the dead, where Jesus was not abandoned, and his body did not experience decay before he was raised from the dead (Acts 2:32) as the first-fruits of the new order of resurrection, in which all the saved will participate when Christ returns (1 Cor 15:22-23). The thief would likely have been ignorant of the implications of his being “with Jesus” after his death, in regard to his later being raised to life, but at least he was assured of being among those whose destiny after death was good. It is certain that Jesus was not personally extinguished in his humanity, in death, and then recreated (reincarnated) 3 days later. That would entail 2 incarnations and be a highly irregular Christology. On the other hand, it is important that we not treat Jesus’ situation as unique. In his experience of death and resurrection for us he went through the process that we who are “in Christ” also go through, thereby transforming the meaning of death for us and assuring us of the resurrection to glory. It was the eternal Word, who was pure spirit, who took upon himself human nature (i.e., he added to his essential divine attributes the essential human attributes). What matters for us here, is the continued personal existence of Jesus as both God and man, after his bodily death, which, in the manner Jesus experienced death as a human being, was no different from that of every other human being. As the Definition of Chalcedon put it, in being begotten of the virgin Mary, the eternal Son of God became a man “like us in all respects apart from sin,” and this pertained equally to his experience between death and resurrection. On the monist construct, Jesus would have ceased to be a human person when his body died, but that would be a dissolution of the incarnation, which is clearly unorthodox. On the other hand, if we are purely material beings but Jesus was substance dual in his humanity, then he was a one of kind human being, and hence not “like us in all respects.” Consequently, I conclude that we have strong Christological grounds to affirm that human beings are substance dual as Jesus was, in his assumption of humanity. Both Jesus and the thief continued to exist as human persons, in paradise, after they died bodily on their crosses. The thief could die in confidence that he would not experience the second death, though his understanding of how that was ensured by Jesus’s death as his sin-bearer would almost certainly have been very limited. Thankfully, we are saved by faith, not by the extensiveness or the correctness of our theology. Although both the righteous and the wicked die bodily, death has a very different significance in the life of the righteous, and this is most vividly portrayed in the Bible’s teaching regarding resurrection. Both the righteous and the unrighteous die, but Old Testament believers did not view the death of the righteous as either an inescapable evil nor as their complete end. Psalm 49:14 speaks of the death of the morally foolish as their end: “straight to the grave they descend, and their form shall waste away: Sheol shall be their home.” But the Psalmist expects a different future, for God “will ransom [his] soul from the power of Sheol” (Ps 49:15). God will “receive” the Psalmist. With Isaiah this hope becomes explicit and strong. God “will swallow up death forever. Then the Lord God will wipe away the tears from all faces, and the disgrace of his people he will take away from all the earth” (Isa 25:7-8). In the day of God’s victory, his “dead shall live, their corpses shall rise. O dwellers in the dust, awake and sing for joy! For your dew is a radiant dew, and the earth will give birth to those long dead” (Isa 26:19). I hear the music of Handel’s Messiah” when I read Job 19:25-26, the wonderful hope of the righteous one: “For I know that my Redeemer lives, and that at the last he will stand upon the earth; and after my skin has been thus destroyed, then in my flesh I shall see God.” But Daniel 12:2, more clearly than any other old covenant text, reveals to us that, although everyone will be raised, both the righteous and the wicked, their experience will differ greatly. Some of those “who sleep in the dust of the earth” will awake “to everlasting life,” but others “to shame and everlasting contempt” (Dan 12:2). With God’s raising of Jesus as an act of vindication of his righteousness, the biblical expectation of universal resurrection gets much more explicit, but so does the difference between its significance for those who die “with Christ” and those who die outside of union with Christ. In words reminiscent of Daniel 12, but given new import, Jesus had clearly taught his disciples that “the hour is coming when all who are in their graves will hear [the Son of Man’s] voice and will come out—those who have done good, to the resurrection of life, and those who have done evil, to the resurrection of condemnation” (Jn 5:29). So important is this difference in the aftermath of resurrection for the righteous and the wicked, that the New Testament does not mention the resurrection of the wicked anywhere near as often as that of the righteous, because it is only good news for those who die in communion with Christ. Only to those who seek “glory and honor and immortality” will God give eternal life (Rom 2:7). Christians have uniformly affirmed the resurrection of everyone at Christ’s return, and there has been no controversy over what this means for those who died in faith, regardless of the covenant under which they died. Believers, even those whose faith was necessarily pre-Christian (that is, whose response to God was assessed according to an earlier covenant than the new one), are raised with Christ, to enjoy life in the new heaven and earth that God establishes after the final judgment. But unbelievers do not participate in the redemption accomplished by Christ, and they are excluded from the gloriously renewed creation. Instead, their destiny is Gehenna, hell, the consuming lake of fire, shame and contempt. By contrast with the righteous in Christ, who are given immortality and eternal life, those who are condemned are punished with the second death (Rev 2:11, 20:6, 14, and 21:8). With these texts in view, we are pushed to reconsider the meaning of God’s warning to Adam and Eve that, if they sinned, they would “die.” Paul saw death as the quintessence of God’s punishment of the wicked; but to which death did God’s original warning, and Paul’s description of the consequences of Adam’s sin and ours, refer? The most plausible answer, I propose, is: “both.” But it is not always easy, in biblical texts, particularly in the Old Testament, to differentiate between the two deaths in statements about God’s punishment of the wicked. The stark contrast between those in Christ, who are justified by his grace, on the basis of Christ’s saving work, and those outside of Christ, is the difference between life and death. Everyone (except those transformed at Christ’s return [1 Thess 4:17]) dies the first death, for all of us are sinners, but only those whose sin is not covered or atoned for, are subjected to the second death. Unless we have good reason to believe that there is a major difference in the meaning of “death,” between its first and second occurrence, I suggest that we should consider it to have essentially the same sense in both cases. One major reason that so many in the Christian church since Augustine have given the two deaths very different meanings is the adoption of a Platonic (rather than biblical) view of the human soul as intrinsically immortal. If that view is correct, then the final punishing of the wicked must be a punishing which is consciously experienced by them forever, because they cannot be killed. Few evangelical theologians these days attribute an inherent immortality to the human soul, so I am not going to present the biblical reasons for denying the intrinsic immortality of human souls which undergirds the doctrine of eternal conscious torment. But, anyone who affirms this traditional (non-Platonic) understanding must grapple seriously with the biblical incongruity of God’s giving endless and inextinguishable life to those who are not in Christ. This runs counter to the very clear New Testament assertion that eternal life is God’s gift only to sinners whose death penalty was born on their behalf by Jesus, and appropriated by them through faith. Eternal life is a gracious gift which God gives only to those who believe (cf. Jn 3:16). It is to those who are faithful unto (the first) death, that Jesus promises the “crown of life” (Rev 2:10). It is those who conquer who “will not be harmed by the second death” (Rev 2:11). Only those who are faithful to their Lord Jesus, even unto death, participate in the first resurrection, the resurrection of those who are raised to join Christ when he returns (Rev 20:4-5). Over such people, “the second death has no power” (Rev 20:6). It is clear that there is a fundamental similarity between the first and second deaths. In both cases, the experience of the dead person is an experience of being deprived of life. Furthermore, Scripture uses the same descriptive terms for both deaths. Those who die perish; they are destroyed. The Hebrew term Sheol and its counterpart, the Greek term Hades, referred to the place of the dead, into which both the righteous and the wicked went when they died; that is they speak of the “first death.” By contrast, Jesus used a different word, Gehenna, to speak of the place where only the wicked go, the final destiny of those whom God condemns in the final judgment. Outside of the synoptic Gospels, this term is only used once, by Jesus’ brother James, who describes the terribly destructive potential of the human tongue. It is “a fire,” which is “placed among our members as a world of iniquity; it stains the whole body, sets on fire the cycle of nature, and is itself set on fire by hell (Gehenna)” (Jas 3:6). The hellish power of the unrestrainedly sinful tongue is destructive: it is “a restless evil, full of deadly poison” (Jas 3:8; emphasis supplied). The apostle John never uses Gehenna to speak of the judgment of the wicked, but his choice of terminology, the “lake of fire” (Rev 19:20; 20:10, 14-15), is clearly a reference to what Jesus called Gehenna, and John says that the lake of fire is the second death (Rev 20:14). It is into the lake of fire, the second death, that the wicked were placed (Rev 20:15), when they were “given up” by Death and Hades and “judged according to what they had done” (Rev 20:13). Fascinatingly, when Death and hades are emptied, they themselves are “thrown into the lake of fire” (Rev 20:14). When God gives eternal life in the new earth to those whose names were written in the book of life, “death will be no more” (Rev 21:4). And after God’s consuming fire has destroyed the wicked, death will also “be no more” outside of God’s new heaven and earth. For many live as enemies of the cross of Christ; . . . Their end is destruction; . . . their glory is in their shame. . . . But our citizenship is in heaven, and it is from there that we are expecting a Savior, the Lord Jesus Christ. He will transform the body of our humiliation that it may be conformed to the body of his glory” (Phil 3:18-21; emphasis supplied). How terribly stark the difference is between glorious transformation and destruction! (cf. 2 Thess 1:9). In Mattthew 5:22, Jesus severely warns his listeners against anger and insult toward a brother or sister in the faith, alerting them to the fact that this will make them “liable to the hell of fire.” Jesus goes on then to teach us that adultery is not just a matter of physical action, it is more fundamentally a matter of the heart: for a man to look at a woman with lust is to have “committed adultery with her in his heart” (Mt 5:27). Furthermore, breaking the 7th commandment, even in our hearts, makes us deserving of Gehenna. So severe is that fate, that we should tear out our eye and throw it away, if it is causing us to lust, because “it is better for you to lose one of your members than for your whole body to be thrown into hell” (Mt 5:29-30). 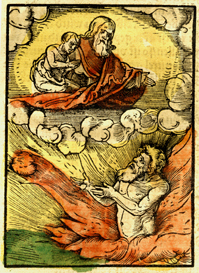 In a parallel text in Mt 18:9, Jesus gives the same warning but is quoted as describing the danger to which sin leads as being “thrown into the hell of fire.” Mark 9 gives us a parallel account of this teaching of Jesus, in which Jesus warns not only that God’s final judgment of unforgiven sin will be the “hell of fire,” but that it will be the “unquenchable fire” (Mk 9:43). This statement is soon expanded further: “It is better for you to enter the kingdom of God with one eye than to have two eyes and to be thrown into hell, where their worm does not die, and the fire is not quenched” (Mk 9:47-48 ESV). To those who believe that God gives endless life, even to the wicked, this text, translated as by the RSV (“never dies” and “is never quenched;” emphasis supplied), is cited in support of that conviction. But I cite the ESV here because it better represents the Greek text’s use of a simple ou (“not,” rather than “never”). We can reasonably assume that Jesus (and Mark) had Isaiah 66:64 in mind with this statement. This is very important, because in that last verse of Isaiah, the objects that are being eaten by worms and consumed by fire are the “dead bodies” of those who rebel against the Lord when he comes to make the new heavens and the new earth (Isa 66:22-23). In quoting Isaiah, Jesus is not speaking about the fire of hell as a fire which will “never go out” (as per the unfortunate translation by the CSB), but as a fire which will not be quenched or put out. The fire of God’s judgment is a fire which will continue to burn until it has completely consumed the combustible material which the fire was destroying. Similarly, the point of Isaiah and Jesus is not that God will do a miracle in the eschaton, by keeping alive forever worms which are consuming human bodies, but that the worms will live for as long as there is rotting flesh for them to eat. Jesus is warning the hypocritical religious leaders of his day that if they continue on their course, they will end up in the fire of hell, and there will be no escaping that fire because no one can quench it, so it will burn until it has completely consumed all its combustible material, just as the corpses of dead bodies are burned on a funeral pyre or are consumed by worms eating the flesh of the dead. In Matthew 10:28, on the other hand, Jesus gives us one of the briefest, and most clear and vivid, differentiations between the first and second death that we find anywhere in Scripture. He is instructing his followers about whom they should fear. We all naturally shrink from putting our lives at risk. But, lest we be tempted to protect our lives now, at the grave risk of forfeiting eternal life, Jesus urges us: “Do not fear those who kill the body but cannot kill the soul; rather fear him who can destroy both soul and body in hell.” (Cf. James 4:12: “There is one lawgiver and judge who is able to save and to destroy.”) In Jesus’ portrait of eternal punishment on this occasion, it is analogous to the bodily death that brings to an end our life in this world/age. Both the first and the second deaths deprive us of life. Matthew depicts Jesus in sharp conflict with many of the Jewish religious leaders of his day (“scribes and Pharisees”), and the reason for his severe condemnation of those leaders is clearly explained in Matthew 23:13-15. Whereas the role of those teachers should have been to bring people into the “kingdom of heaven,” under the rule of God and in fellowship with him, Jesus charges the teachers with being personally hypocritical. More important than their own shocking failure to be citizens of God’s kingdom, living obediently under his rule, was the fact that they not only stayed out of the kingdom themselves, they “locked” other people out of God’s kingdom, even when those people were endeavoring to enter that kingdom (Mt 23:13-14). Jesus then equates the condition of being excluded from the kingdom of heaven with being “a child of hell” (Mt 23:15). Jesus identifies these hypocritical religious leaders as “descendants of those who murdered the prophets,” and he warns that they are on a course which will make it very difficult for them to “escape being sentenced to hell” (Mt 23:33). In Matthew 7:19 Jesus does not used the word Gehenna, but he seems clearly to be referring to the same reality when he warns us against false prophets. We will know them by their fruit, because they do not bear good fruit, since they are not good trees. “Every tree that does not bear good fruit is cut down and thrown into the fire.” Similarly, in the parable of the weeds (Mt 13:18-23), Jesus declares that the weeds will be gathered by the reapers and “burned” at harvest time (Mt 13:29). Again, in the parable of the sheep and the goats, concerning the judgment of the nations, in Matthew 25:31-46, the king “will say to those at his left hand, ‘You that are accursed depart from me into the eternal fire prepared for the devil and his angels’” (25:41; emphasis supplied), and “these will go away into eternal punishment, but the righteous into eternal life” (25:46). The writer to the Hebrews, similarly, does not use the term Gehenna, but he tells us that “if we willfully persist in sin after having received the knowledge of the truth, there no longer remains a sacrifice for sins, but a fearful prospect of judgment, and a “fury of fire that will consume the adversaries” (Heb 10:26-27; emphasis supplied). In the case of second death, however, many (I have argued that we have reasons to hope most) of the human race will not experience it. There is only one way in which this can happen, and that is through participation in the benefits of the atoning death of Christ. That was the main thrust of Paul’s teaching in Rom 5:12-21. He certainly stated numerous times that all of us sinned, thereby being implicated with Adam in guilt and necessarily facing the punishment of second death. But, says Paul, “much more surely have the grace of God and the free gift in the grace of the one man, Jesus Christ, abounded for the many” (Rom 5:15), because “the free gift following many trespasses brings justification” (5:16). It is absolutely certain that “those who receive the abundance of grace and the free gift of righteousness exercise dominion in life through the one man, Jesus Christ” (5:17). The wonder of all this is that, although “sin exercised dominion in death,” grace exercises “dominion through justification leading to eternal life through Jesus Christ our Lord” (5:21). We can all expect to die bodily, and we know that we will all be raised from the dead to face either vindication or condemnation on the day God’s final judgment. Although resurrection will be universal, its significance will vary vastly. Those who died in Christ, having exercised the faith response required by God relative to their knowledge of God, will be raised again with him. Jesus himself was saved from death (Heb 5:7-10), which is clearly the second death, since he experienced the first one in accomplishing our salvation. Those who believe in Christ are therefore said to have “died with him” (Rom 6:8). Being vindicated by God as one who did not deserve eternal or second death, Christ rose again, and his resurrection was the firstfruits of a new order of resurrection. All who belong to Christ will be raised with him (1 Cor 15:23). Having died with him through faith, we will also be raised with him if we persist in that faith (Mt 24:13). In the Revelation of Christ to John, this is spoken about as two resurrections (Rev 20:4-6). Whether those occur at the same time (as amillennialists and postmillennialists believe) or with a long period of time in between (as premillennialists believe), is not important to us here. The critical truth being communicated through John is that there are two different kinds of resurrection, with vastly different ends. The resurrection of the wicked is not often mentioned in Scripture, but it is very clearly taught in both Testaments. In Daniel 12:2, we are taught that many who “sleep in the dust of the earth” will “awake, some to everlasting life and some to shame and everlasting contempt.” Jesus taught us that “the hour is coming when all who are in their graves will hear [the Son of Man’s] voice and will come out—those who have done good, to the resurrection of life, and those who have done evil, to the resurrection of condemnation” (Jn 5:28-29). John speaks of this critical difference of destinies among those whom God raises from the dead in terms of first and second death. Echoing Paul in 1 Corinthians 15, John tells us that those who lost their lives, as a result of their faithfulness to Christ, participate in the “first resurrection” (Rev 20:4-5). This is the resurrection of which Christ was the firstfruits, and in which all who die “in Christ” are raised “with Christ.” Those who “share in the first resurrection” are “blessed and holy,” and over them “the second death has no power, but they will be priests of God and Christ, and they will reign with him” (Rev 20:6). So, it is normal for everyone to die the first death, but only those who die in Christ experience the “first resurrection.” For these people, among whom I thank God I am one, by God’s grace through Christ, the first death is the only death we will experience. Being justified by God because of Christ, we are no longer under condemnation, and so we rise to the glory of becoming transformed into the likeness of Christ (1 Jn 3:2). We rise to everlasting life (Dan 12:2), so we will never die again. But those who suppressed God’s revelation, and who resisted his gracious overtures persistently throughout their lives, did not die to sin with Christ, were not justified by grace through faith, and must therefore rise to shame and contempt (Dan 12:2). They will acknowledge the justice of God’s sentencing them to eternal death from which there will be no second resurrection. They will be cast into the “hell of fire,” the “lake of fire,” the experience of God’s terrible, unmitigated, wrath. This will destroy them, for our righteous God is a “consuming fire” (Heb 12:29). None of us is inherently immortal; we exist, as all things other than God do, because he gives us existence, and if God does not give us life, which he promises to do only to those who are saved through Christ, then we die completely, cut off from God, the source of life. Through his death, Christ destroyed “the one who has “power of death, that is the devil” (Heb 2:14). But those who reject God’s gracious work of salvation in Christ remain under the devil’s power, and they must suffer God’s judgment upon them for their own submission to Satan, when God decisively brings to a culmination the victory of Christ over Satan, condemning him and all who serve him (Rev 20:10). Christ must reign until he has “destroyed every ruler and every authority and power” (1 Cor 15: 25), and since Satan will then have lost the power of death, death itself, which is God’s “last enemy,” is destroyed (1 Cor 15:26). In his highly symbolic vision, John saw this as an event in which “Death and Hades were thrown into the lake of fire,” which is “the second death,” and “anyone whose name was not written in the book of life was thrown into the lake of fire” (Rev 20:14,15). Consequently, it is clear that, though death is the penalty for sin, and though God’s punishment of the wicked is an eternal punishment, the “eternal punishment” that is “eternal death” cannot be an endless dying or an endless experience of being punished, as in eternal conscious torment. Were that the case then God would be giving eternal life to everyone, which Scripture specifically denies is the case. Death, the deprivation of life, is the just penalty of unforgiven sin, and it is a never-ending penalty precisely because there is no second resurrection for those who experience the second death. Apart from life in Christ, there can be no life at all. All of us can expect to die the first death, and all of us will also die the second death, that is, we will “perish,” unless we receive God’s gift of eternal life through believing in Christ (Jn 3:16). “Thanks be to God for his indescribable gift” (2 Cor 9:15). We have already observed that the first death is a negative consequence with universal impact on human beings, but it does not always have the same significance. Psalm 116:15 says: “Precious in the sight of the Lord is the death of his faithful ones.” But God tells us through Ezekiel, that he has “no pleasure in the death of anyone.” Since human death is inextricably connected to sin, as its necessary consequence, God would prefer that sinners would turn from their evil and live (Ezek. 18:32; cf. 3:18-21; 18:23; 33:10-20). On initial reflection, it seems to me that it would have been ideal if Adam and Eve had passed the probationary test, chosen to obey God’s command that they not eat of the tree of the knowledge of good and evil, and then been confirmed in their goodness, as the elect angels (1 Tim 5:21) were. As with the angels who remained faithfully obedient to God when rebellion occurred among them, there would then have been no further possibility of sin’s occurrence in the human world. Adam and Eve would not then have been prohibited from eating of the fruit of the tree of life, and the wonderful situation described in Revelation 21 and 22 could have been immediately implemented without the need for a new heaven and earth. What if God, desiring to show his wrath and to make known his power, has endured with much patience the objects of wrath that are made for destruction; and what if he has done so in order to make known the riches of his glory for the objects of mercy, which he has prepared beforehand for glory—including us whom he has called, not from the Jews only but also from the Gentiles? Since the fall of Adam, human death has become a “natural evil.” It exists because sin came into the world and all of the human race was implicated in it. But that is not the whole story. When God pronounces a curse on the S/serpent for his role in the fall of Adam and Eve, he includes what has been referred to as the “protevangelium,” or “the first glimmer of the gospel” (Derek Kidner, Genesis, 70), going back as far as Justin Martyr (ca. 160 AD) and Irenaeus (ca 180 AD) (David Wenham, Genesis 1-15, 80-81). God warned that he would “put enmity between [the S/serpent] and the woman,” and that the serpent would strike the heel of the woman’s offspring, but that her offspring would strike the serpent’s head. From the later narrative in the Bible, we learn that the Serpent would bring about the death of the descendant of Eve who was also uniquely the Son of God but that, in so doing, the Serpent would bring about his own demise because the grave could not hold the Righteous One. And his death, which looked to the disciples at the time as a terrible defeat, proved to be the means of God’s victory over Satan. Satan’s fatal miscalculation in bringing about the unjust capital punishment of Jesus, the only sinless human being, was God’s means of providing a vicarious atonement for all who would believe in him, and this in turn was climaxed by the casting of Satan and all his followers into the lake of fire. Although the death of unbelievers provides no accompanying grounds for relieving the grief of survivors, its source of terror is multiplied for any who have the slightest indication of the unmitigated disaster of the second death. Consistently, that death is portrayed in Scripture, not as an ambiguous negative consequence of death’s having come into the world through sin, but as the inconceivable horror of facing the wrath of God unrelieved by his mercy. Hell, the lake of fire, and the second death are terrible, and they are the certain future of those who are raised from the dead to stand before God on the day of judgment. In thinking about the nature of the final divine judgment of the wicked which is most appropriately spoken of as “hell,” we are called upon to pay heed to the frequent mention of “fire,” in connection with Gehenna, and in other names or descriptions of the final judgment. I spent many years as a traditionalist, believing in hell as eternal conscious torment. For a long time, I was firmly convinced, but later my conviction became quite tenuous. 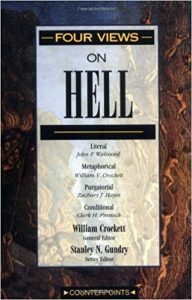 In my tenuous days, I read William Crockett’s edited work on Four Views on Hell, published by Zondervan in 1992. Of the four views, although strongly impressed by Pinnock’s case for the “conditional” view, my choice as a traditionalist was then between the “literal” view propounded by John Walvoord and the “metaphorical” view put forward by Crockett himself. Walvoord argued that “the frequent mention of fire in connection with eternal punishment supports the conclusion that this is what the Scriptures mean (cf. Mt 5:22; 18:8-9; 25:41; Mk 9:43, 48; Lk 16:24; Jas 3:6; Jude 7; Rev 20:14-15)” (p. 28). Unfortunately, Walvoord chose “the case of the rich man and Lazarus in Luke 16:19-31,” as his primary instance of “sufficient evidence that the fire is literal.” I describe this as “unfortunate” because that story identifies the rich man as in hades, which Walvoord himself notes is “used of the temporary place of the unsaved after death but is not used in relationship to the lake of fire or eternal punishment” (p. 19; emphasis supplied). Consequently, Walvoord’s suggestion that the rich man’s asking for water because he was “in agony in this fire” (vs 24) is not good support for the literalness of the fire of hell. Even if it were, however, we ought not to assume that the fire would burn endlessly and that the people in it would likewise remain alive forever. Crockett, on the other hand, sides with John Calvin and Charles Hodge in the conviction that the Bible’s references to fire, when speaking of God’s judgment of the wicked, are best understood as “figurative expressions warning the wicked of impending doom” (p. 44). Crockett guessed from his own “informal survey” that “most evangelicals interpret hell’s fires metaphorically, or at least allow for the possibility that hell might be something other than literal fire” (p. 44). In a footnote, he lists as examples: Donald Carson, Millard J. Erickson, Carl F. H. Henry, Roger Nicole, Ronald Youngblood, F. F. Bruce, Billy Graham, Donald Gurthrie, Kenneth Kantzer, C. S. Lewis, Leon Morris, and J. I. Packer (fn 6, pp. 44-45). Crockett’s “strongest reason” for taking biblical references to hell as literal fire is that it is “also described as darkness” (Mt 8:12; 22:13; 25:30; 2 Pet 2:17; Jude 14), and these are “mutually exclusive terms” (p. 59). Similarly, he finds literally incongruous descriptions of the wicked as burning eternally “even though at the same time they are said to be rotting away with worms and maggots” (p. 59). Crockett also notes that “the eternal fire was created for spirit beings such as the devil and his angels (Mt 25:41),” and that believers will be raised with “spiritual bodies” (1 Cor 15:44), so “perhaps the fire is in some sense a spiritual fire” (p. 61). Like the many evangelical theologians Crockett named, when thinking as a traditionalist, I too leaned toward a metaphorical, perhaps more psychological than physical, understanding of the endless punishment of hell. Now that I have become convinced that God destroys the wicked, removing all wickedness completely from his creation, so that he can once more look at all he has made and declare it “very good,” I am less squeamish about reading literally the biblical descriptions of God’s judgment as “fire.” When we read it that way, we see again the similarity between the final fire and the fire which was God’s means of punishing sinners with the first death (cf. Num 11:1; 16:35 ; 26:10 ; Lev 10:2; 2 Kings 1:10, 12, 14; 2 Kings 1:12 2 Kings 1:14 ). More significant to me than whether “fire” is literal or metaphorical, as God’s means of pouring out his wrath upon the wicked in the second death, is the clear intention of Scripture to provide a depiction of God’s punishment of the condemned as destructive. The proposal that God will miraculously keep alive forever sinners, who would otherwise be consumed by the unmitigated outpouring of God’s wrath upon them, is strongly contrary to the dominant thrust of the biblical descriptions of hell. Given that the effect of God’s punishment of the wicked will be eternal death (not eternal life), the specific nature or means of God’s punishing, which leads to destruction of body and soul, is relatively insignificant. Darkness will certainly result from God’s withdrawal of his presence, given that he is light and the source of all light, but fire very vividly portrays the nature of God’s consuming wrath, whether or not it is exactly like the fire by which our houses are burned down and people are destroyed in this life. The Bible frequently speaks of fire as God means of punishing wicked people or cities, when he causes their first death for punitive purposes. In every instance the effect of that fire is to kill them or destroy them, not to torture or torment them. The apostle John used “second death” to describe the significance of the lake of fire. Unless we find clear reasons for considering the two deaths as fundamentally different in nature, we should assume that “death” has essentially the same sense in regard to the kind of death against which we are warned. That is to say: “death,” in both instances, describes the taking away of a person’s life. From the teaching of Jesus himself we get a strong picture of destruction in his descriptions of the end of the wicked, and he is clear about how this destruction differs. We’ll unpack that difference shortly, in item number 4. It may be worthwhile for us to recall at this point that bodily death by burning is a very painful process. 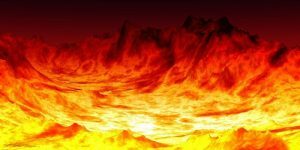 I think it likely that God’s choice to describe the final punishment of the wicked as death in the lake of fire intentionally brings to our minds what we know about the first death in this regard. Without pretending to know more than Scripture tells us about the experience that awaits the wicked as their judgment leading to death is carried out, I think that we should assume a painful process. Since we have biblical indication that there will be gradations of severity in the punishing process (Lk 12:47-48), demonstrating the justice of God’s judgment, it is reasonable to conclude that the pain of the experience of God’s wrath, that finally leads to death for all the wicked, will vary in its nature and severity. Ultimately, no creature, however hardened through years of rebellion against God, will be able to tolerate the outpouring of the just wrath of God, which will finally lead to certain destruction of body and soul (Mt 10:28), in its culmination. Hades was temporary for everyone, both the righteous and the wicked. As we saw in Rev 20:13-14, the second death is not only the end of the wicked, it is the end of the first death and of Hades, the place where all the first dead went to wait for resurrection. For the righteous, their delivery from Hades results in their settling forever, with everlasting or eternal life (Jn 3:16; Mt 25:46), into their new dwelling place with God, the new heaven and earth. But, for the wicked, leaving Hades is a move to a far worse place, Gehenna, the lake of fire, the place where God is present only in wrath and not in grace. There, they do not receive eternal life, they perish (Jn 3:16). Unlike the first death, from which the wicked were raised, there will be no second resurrection from the second death. Their experience is like that of the righteous in that it is eternal (Mt:25:46), but it is an “eternal punishment.” It is analogous to the capital punishment of criminals with the first death, in that it is final and irrevocable. This punishment never comes to an end, and this brings us to the fourth difference: first death was partial in its destructiveness, but second death is total, consuming the entire person. In our earlier consideration of the similarities between the first and second death, I made reference to the highly significant statement of Jesus in Matthew 10:28. There we saw that the first and second deaths are alike in that both of them deprive people of life. But Jesus’ point on that occasion was not to draw listeners’ attention to the similarities between first and second death, but to impress upon them how much more severe the second death, hell, is than the first. The second death entails not just a death of the body, which results in burial in the grave, but a destruction of “both soul and body in hell.” Note that the effect of the “hell of fire” is depicted by Jesus in Matthew as destruction, not as everlasting torment. What we dare not do is “deny [Jesus] before others,” because Jesus will deny those who do this before his Father in heaven (Mt 10:33) and we know that only those who come to the Father through the Son are given life in heaven with God (Jn 14:6). However highly we may value the preservation of our lives in this world, preserving them for eternity is far more important. I am aware, of course, that this point assumes the correctness of substance duality. I know that there are evangelical scholars who believe that Scripture teaches a physicalist understanding of human being. For them, this fourth point, if acceptable at all, would have to be very differently stated. Thus far, the reading I have done in the work of evangelical physicalists has not persuaded me that substance dualism is wrong. Some time, I hope to write a post spelling out my reasons for believing that the Bible leads us to affirm a substantial distinction between body and spirit. of course, we have to postulate that God looks after those who have died in the Messiah. They are “with the Messiah, which is far better”. But to say this we don’t need to invoke, and the New Testament doesn’t invoke, the concept of the “soul”, thereby offering, like the Wisdom of Solomon, a hostage to platonic, and ultimately anti-creational, fortune. What we need is what we have in scripture, . . . the concept of a creator God, sustaining all life, including the life of those who have died. But the God who in Jesus the Messiah has gone through death and defeated it has declared that “those who sleep through Jesus” are “with the Messiah,” and he with them. This “with”ness remains an act, an activity, of sheer grace, not of divine recognition of some part of the human being which can, as it were, hold its own despite death. Paul and the other early Christian writers didn’t reify their anthropological terms. Though Paul uses his language with remarkable consistency, he nowhere suggests that any of the key terms refers to a particular ‘part’ of the human being to be played off against any other. As a systematic theologian, however, I am not content to stop where N. T. Wright leaves things after his analysis of the biblical terminology for the aspects of human being. (I doubt that the Christian philosophers he addressed would have been willing to do so either.) With Wright, I certainly reject any denigration of the importance of the body or of physicality in general, and I affirm enthusiastically his insistence that any human personal existence that remains between bodily death and resurrection is an act of God’s grace. That God raises to life the bodies of the dead is a very fundamental truth of Christian eschatology, as is the renewal of all of creation. I concur with Wright that the New Testament does not use one particular term, always and only, to refer to the ongoing personal existence of human beings after death, or to identify the aspect of the human constitution which God keeps alive after bodily death has occurred. Following the common pattern in Christian theology, however, I have referred to the immaterial aspect of human being as “soul,” envisioning that term as then encompassing other super-physical aspects such as mind, spirit, conscience, and will. Nudged by Wright’s paper, however, I plan to change my language, and to speak generally of “spirit” rather than “soul,” when I speak of the non-material aspect of human being to which the NT frequently refers with terms such as heart, mind, soul, and spirit. Although “spirit,” like “soul,” is not always used as a reference to the immaterial aspect of human being which God keeps alive between death and the resurrection, its use is narrower than that of “soul,” and “spirit” much less often connotes the totality of human being, both material and immaterial, than “soul” does. A further advantage of speaking of “body and spirit,” rather than of “body and soul,” is that it might not immediately bring to hearers’ minds the philosophical history of the use of “soul” by the likes of Plato or Descartes. 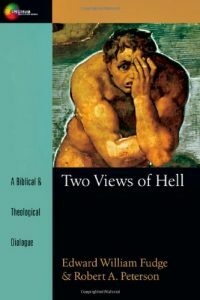 Zondervan has published two versions of their book on “Hell” in their series of multi-view books on theological subjects. The first one, edited by William Crockett (Four Views on Hell) in 1992, included the “Literal” view, the “Metaphorical” view, the “Purgatorial” view and the “Conditional” view. This was a misleading collection, because only three of those views were actually “views on hell,” since hell is the place where the wicked are finally punished. By definition, purgatory is the experience of people who are not destined for hell, but who are not yet prepared for heaven. It is therefore the last stage of God’s sanctifying or saving process in the life of those who die with the faith that justifies. It is not a version of post-mortem salvation, and it is not a doctrine of second death. If the doctrine of purgatory is correct, then both those who will be saved and those who will be eternally damned will face suffering or torment for their sin. But, in the case of the justified that suffering will be purifying in its effect, whereas it will result in the perishing or destruction of those who died in unbelief. Properly speaking therefore, this is only a book about Three Views on Hell, and two of those views were different versions of eternal conscious torment. 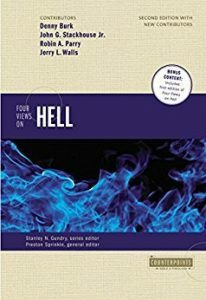 Twenty four years later, Zondervan published a second edition (Four Views on Hell: Second Edition) edited by Preston Sprinkle. These views were: eternal conscious torment, terminal punishment, universalism, and purgatory. Once again, we find that only two of the views are truly views of hell. Both purgatory and universalism are eschatological views, but they are primarily soteriological, that is, they are most importantly doctrines describing the future stages of salvation. Neither of them is a view of the second death, of God’s punishment of the unrepentant and unbelieving wicked. The two soteriological views differ from one another quite significantly. Universalism is an affirmation of post-mortem salvation of those who die under God’s condemnation, but purgatory is not. In the doctrine of purgatory, those who die believing but not sufficiently purified must suffer for a while after death, but their suffering is remedial rather than punitive. It is like effective surgery rather than like capital punishment. Those who affirm the soteriological doctrine of purgatory must still choose a view of the nature of God’s punishment of the wicked. Some who believe in purgatory could affirm eternal conscious torment, but others might be conditionalists/annihilationists. In the doctrine of dogmatic universalism (i.e., the view which is confident rather than only hopeful that all will be saved), the suffering of all the unbelievers after the divine sentence of judgment is actually purgatorial, since its final end is the eternal salvation of everyone who experiences it. In short, there are really only two views of hell. Either God gives eternal life of a highly undesirable kind to those who are condemned to hell, or he destroys them. We might say that there also two views of purgatory: in one view, those who die justified but insufficiently sanctified, must suffer for a while as part of God’s saving work in their lives; in the other view, everyone who dies in an unjustified state suffers God’s painful, but redemptive, post-mortem work of grace. On this particular subject, therefore, InterVarsity Press’s decision to publish a book on Two Views of Hell (Fudge and Peterson, destruction and eternal conscious torment) was more helpful. The theories of purgatory and universalism are certainly well worth our study. But, when we work on them we should be clear that we are not studying the nature of hell, and we are primarily doing soteriology, and only secondarily eschatology, in that we are studying the final phase of salvation. This entry was posted in Eschatology and tagged annihilationism, death, hell, intermediate state, purgatory, resurrection, second death, traditionalism, universalism. Bookmark the permalink. Thanks for this well written, thoughtful post. It seems to me that one of the advantages of your view is that it allows us to understand “death” to mean what “death” normally means. People all over the world, even children, constantly see death. We see dead animals, and at least at funerals and in the media we see dead people. We know from our massive, universal experience that if something is dead it no longer can feel or think anything. In your view, in the first death our bodies die, and of course dead bodies no longer to feel or think anything until resurrection. In the second death all of a person dies, their soul and their body, and thus there will be no thinking, feeling person left in any form. To me this makes so much more sense than if the Bible meant by “second death” a situation where the unrighteous remain conscious and thinking and feeling forever. Thanks! I pray that many people will read this article and be helped by it. I am really blessed by this article, I pray that God expand your knowledge on this subject so we the readers also can share it with the unsaved for their eventual redemption by our Lord Jesus Christ.